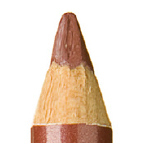 Use these organic lip liner pencils to outline and create a base for lipstick. Helps lipstick last longer. Natural vegetable waxes create a natural, soft line. FD&C dye-free. Gluten-free. Preservative-free. Terracotta is vegan. Tip:Use the natural lip liner to totally fill in your lips where it becomes a base for lipstick. Lipstick lasts 2x longer. i ordered mauve color and i love it! goes on great and easy to sharpen. i also got redvelation lipstick to wear over it and it really does help the lipstick stay on and last throughout the day. The consistency of the lip liner is very nice. The only thing I wish you all would do is, make sure the picture on line is the same as the product. I want a rose color, there seems to not be a lighter pink tone. I am in love with this lip liner, not only is the color exactly what I have been looking for in a natural liner but it also has GREAT staying power. I only bought one, I feel I should have stocked up. I have a new allergy to red dyes, which are in a lot of lipsticks. I went to my local heath food store and the woman behind the counter RAVED about "Ecco Bella" cosmetics and how the contain NO red dyes. With my excitement in finding dye free lipstick, I forgot to purchase lipliners too, so I went on Ecco Bella's web site and purchased 2 lipliners and was very pleased. 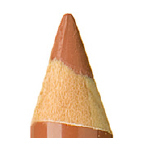 the best lip liner ever! I have thin lips so I line them. I've gone through a lot of liners, and some of them have a strange consistency and get clumpy looking after a while. Not only is this product pretty natural, but it goes on smoothly and doesn't wear off clumpy.